Confined to a wheelchair, retired historian Lyman Ward sets out to write his grandparents' remarkable story, chronicling their days spent carving civilization into the surface of America's western frontier. But his research reveals even more about his own life than he's willing to admit. What emerges is an enthralling portrait of four generations in the life of an American family. "Cause for celebration . . . A superb novel with an amplitude of scale and richness of detail altogether uncommon in contemporary fiction." "The Atlantic Monthly"
"Brilliant . . . Two stories, past and present, merge to produce what important fiction must: a sense of the enchantment of life." "Los Angeles Times"
This Penguin Classics edition features an introduction by Jackson J. Benson. For more than sixty-five years, Penguin has been the leading publisher of classic literature in the English-speaking world. With more than 1,500titles, Penguin Classics represents a global bookshelf of the best works throughout history and across genres and disciplines. Readers trust theseries to provide authoritative texts enhanced by introductions and notes by distinguished scholars and contemporary authors, as well as up-to-datetranslations by award-winning translators. Wallace Stegner was born in 1909 in Lake Mills, Iowa. The son of Scandinavian immigrants, he traveled with his parents and brother all over the West-to North Dakota, Washington, Saskatchewan, Montana, and Wyoming-before settling in Salt Lake City in 1921. Many of the landscapes he encountered in his peripatetic youth figure largely in his work, as do characters based on his stern father and athletic, outgoing brother. Stegner received most of his education in Utah, graduating from the University in 1930. He furthered his education at the University of Iowa, where he received a master's and a doctoral degree. He married Mary Stuart Page in 1934, and for the next decade the couple followed Wallace's teaching career-to the University of Wisconsin, Harvard, and eventually to Stanford University, where he founded the creative writing program, and where he was to remain until his retirement in 1971. A number of his creative writing students have become some of today's most well respected writers, including Wendell Berry, Thomas McGuane, Raymond Carver, Edward Abbey, Robert Stone, and Larry McMurty. Throughout his career and after, Stegner's literary output was tremendous. His first novel, Remembering Laughter, was published in 1937. By the time of his death in 1993 he had published some two dozen works of fiction, history, biography, and essays. Among his many literary prizes are the Pulitzer Prize for Angle of Repose (1971) and the National Book Award for The Spectator Bird (1976). His collection of essays, Where the Bluebird Sings to the Lemonade Springs (1992), was nominated for the National Book Critics Circle award. 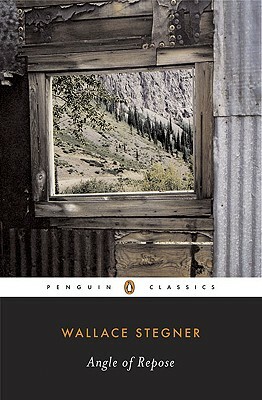 Although his fiction deals with many universal themes, Stegner is primarily recognized as a writer of the American West. Much of his literature deals with debunking myths of the West as a romantic country of heroes on horseback, and his passion for the terrain and its inhabitants have earned him the title 'The Dean of Western Letters'. He was one of the few true Men of Letters in this generation. An historian, essayist, short story writer and novelist, as well as a leading environmental writer. Although always connected in people's minds with the West, he had a long association with New England. Many short stories and one of his most successful novels, Crossing to Safety, are set in Vermont, where he had a summer home for many years. Another novel, The Spectator Bird, takes place in Denmark. An early environmentalist, he actively championed the region's preservation and was instrumental-with his now-famous 'Wilderness Letter'-in the passage of the 1964 Wilderness Act. Honest and straightforward, educated yet unpretentious, cantankerous yet compassionate, Wallace Stegner was an enormous presence in the American literary landscape, a man who wrote and lived with ferocity, energy, and integrity. Jackson J. Benson teaches American Literature at San Diego State University. His biography, The True Adventures of John Steinbeck, Writer, won the PEN USA West award for nonfiction. He lives in La Mesa, California."